Continental Life Insurance Company of Hartford, Conn. Published by Major & Knapp, New York City, no date [after 1863]. Proof lithographs, one with hand coloring. Graphic Arts GC178. It is ironic that Joseph Knapp (1832-1891), soon to be president of the Metropolitan Life Insurance Company, would work so hard to prepare and print the advertising for the Continental Life Insurance Company. Sixteen year old Knapp took an apprenticeship with the New York City lithographic printing firm of Sarony & Major. When he turned twenty-one in 1852, Knapp became their general manager and then, a partner. Thanks to his considerable business skills, Knapp grew the business into one of the most successful lithographic presses in the United States. 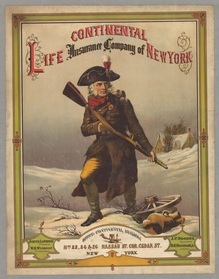 It was at this time that Major & Knapp prepared several versions of an advertising poster for Continental Insurance. 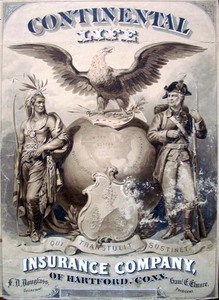 A revolutionary soldier was used on this and other print materials, which became the firm’s icon. Knapp’s attention and his considerable fortune turned to the insurance business. He served on the board of the Metropolitan Life Insurance Company and was eventually named the second president of the company. 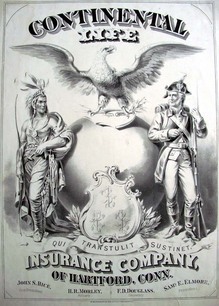 When Knapp stopped printing, Continental Insurance transferred their business to Louis Prang (1824-1909), who redesign the company’s advertising (left) while maintaining the symbol of the revolutionary soldier.